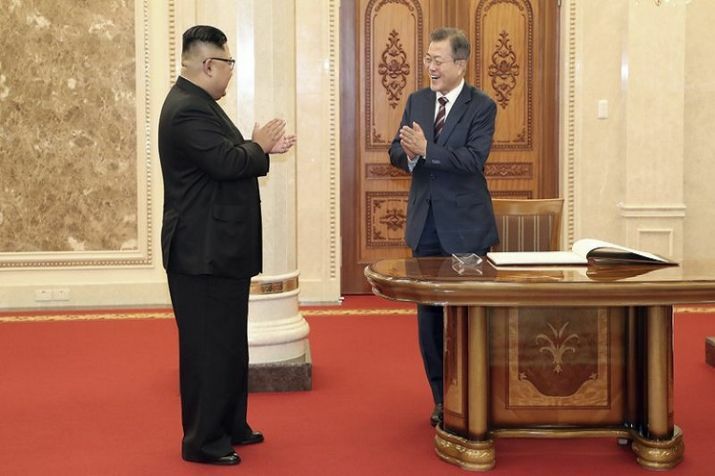 The meeting between the two leaders came about four months after they last met on May 26 inside the Demilitarized Zone that divides the two Koreas. Kim gave the South Korean president an exceedingly warm welcome, meeting him and his wife at Pyongyang’s airport. Pyongyang: South Korean President Moon Jae-in began his third summit with North Korean leader Kim Jong Un on Tuesday with possibly his hardest mission to date — brokering some kind of compromise to keep North Korea’s talks with Washington from imploding and pushing ahead with his own plans to expand economic cooperation and bring a stable peace to the Korean Peninsula. While signaling his willingness to talk with Washington, Kim’s strategy has been to try to elbow the U.S. away from Seoul so that the two Koreas can take the lead in deciding how to bring peace and stability to their peninsula. North Korea maintains that it has developed its nuclear weapons to the point that it can now defend itself against a potential U.S. attack, and can now shift its focus to economic development and improved ties with the South. North Korea just completed an elaborate celebration replete with a military parade and huge rallies across the country to mark its 70th anniversary. China, signaling its support for Kim’s recent diplomatic moves, sent its third-highest party official to those festivities. That’s important because China is the North’s biggest economic partner and is an important political counterbalance to the United States.